Chakra: rot, hara og solar plexus. 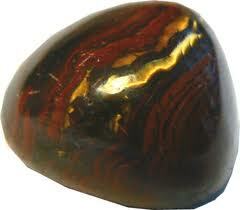 Tiger Iron is a banded stone consisting of layers of tiger eye, jasper and hematite. The name comes from the combination of tiger eye and iron-rich hematite. Along with tiger's eye it is mined primarily in South Africa and Western Australia. Tiger Iron is a stone of courage, strength and stamina. It stimulates the root chakra. With its powerful combination of the vitality of red jasper, and the balancing effects of hematite, tiger iron makes a very powerful grounding and protective stone.